Typically when you think of anti-aging - you think, skin care. But did you know that your hair can suffer from the perils of aging as well? Volume Loss, Breakage, Roughness, Less Shine, Dryness, Brittleness, Unruliness, and Loss of color vibrancy are all signs of aging hair. I know. As if women didn’t have enough beauty dilemmas to deal with already! But if you want your hair to look nice and healthy no matter your age, you have to start an anti-aging regimen early. One of my favorite ways to hydrate my hair and make it more manageable is to give myself a hair mask every few weeks. You can go the natural route, and choose ingredients such as avocado and mayonnaise, or you can simply buy store bought masks – either way it’s great for you hair. But if your locks are in serious need of CPR, well then - fear not my lovelies. I discovered a line that will bring your beautiful hair back from the dead! Nexxus Youth Renewal is the first hair line to combat the 8 signs of aging. You know, I never really thought about how my age can be affecting my hair (other than finding those pesky greys of course), but it makes sense. I’ve definitely noticed more breakage and dryness over the last few years. So in order to get my hair’s youth luster back I jumped on board to try the Nexxus Youth Renewal Elixir. This product is a lightweight leave-in treatment that helps rebuild hair strength by reducing breakage while making hair look more youthful and vibrant. I’ve only been trying for a few days and the biggest difference I’ve noticed is how soft it leaves my hair. A little product goes a long way even with my thick frizzy hair. It smells fantastic and the silky smooth consistency leaves hair shiny and not greasy. I have to keep using it to see if it reduces breakage but I’m hoping that elixir might be magical potion my hair needs. The Nexxus Youth Renewal line consists of shampoo, conditioner, dry shampoo, blow dry spray, and elixir. Prices range from $14 to $20. Lucky for you, Nexxus and Glam want you to try their Youth Renewal line and are offering the first 500 readers a chance to try it for themselves!! All you have to do is click on this link and fill out the form! Good luck! 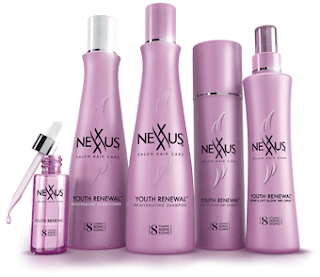 NeXXus Youth Renewal combats 8 signs of aging hair. Our Vita-8 Complex helps improve color radiance, shine, strength, and volume, as well as reduce frizz. Take hair health and stimulate growth! It will allow your hair to style smoothly and keep split ends from damaging and breaking your hair. Its fresh ingredients clean your hair without stripping it. It has been known to improve hair health and stimulate growth.